Are you getting ready to improve your Chattanooga area home with new interior doors, crown molding, or to update your existing stairs? Is it time to “trim out” that great new home currently under construction? Junior’s offers the products to get the project done! Our product offering includes pre-primed and stain-grade moldings, a huge variety of wood and metal stair parts, and more interior door options than you knew were available! 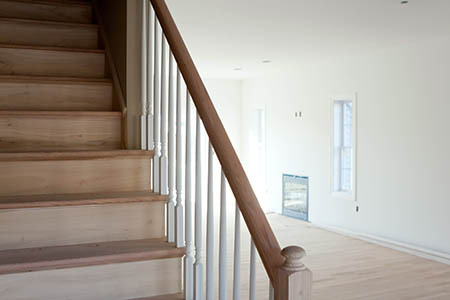 Want to take the carpet of that set of stairs and match them with new hardwood treads to match your flooring? We can do that, too. There’s only one chance to make that great first impression! Are you ready to give your existing home a quick facelift? Want to give guest to your new home a great first impression? Junior’s has a great variety of entry doors available that can make that happen. We have great sources on wood, textured fiberglass (for staining), smooth fiberglass (for painting), and steel entry doors. And you can get them with many options, such as glass cut and style, caming colors, and shape. All available with such reputable names as Thermatru, Simpson, Masonite, Western Reflections, ODL, Plastpro, Rogue Valley, and more. Junior’s can do custom stairs with different species of wood, custom doors, and custom trim. From Crown Heritage Stair Parts we can order different stair parts and species. On exterior mouldings, we can order Fypon, Azek mouldings, and ECMD. No matter how complex or large your needs, you can put us to the test! Junior’s Building Materials wants to help you move on with your home project with a smile on your face knowing that the decisions made will be a part of your daily life. Allow our experience and resources to come through for you!